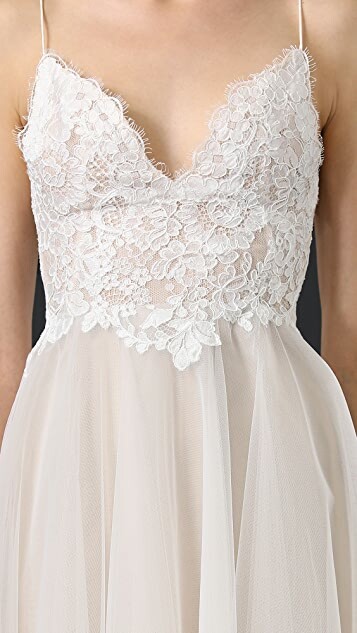 An elegant Monique Lhuillier dress made from airy layers of filmy tulle. Floral embroidery accents the bodice. Hidden zip at open back. Silk lining. Monique Lhuillier’s interest in fashion began in the Philippines, where she grew up inspired by her mother’s elegance and personal style. After finishing her education at the Fashion Institute for Design, Lhuillier presented her first bridal collection in 1996, and was inducted into the CFDA soon after. The success of Lhuillier’s exquisite designs led to the launch of the couture RTW collection and a line of Italian-made footwear. 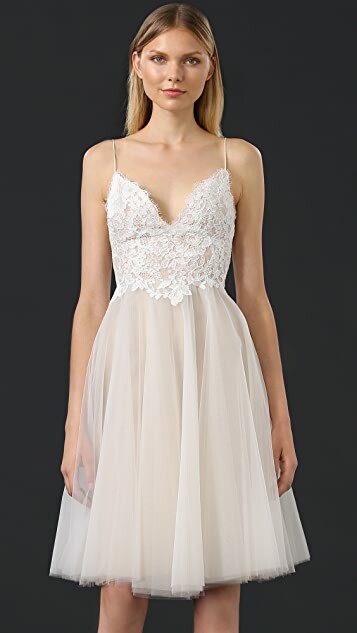 Creating beautiful pieces coveted by celebrities, editors, and stylists alike, the Monique Lhuillier name has come to epitomize taste, quality, and the very best in couture.